A month after Maxis brought the Blackberry Z10 into Malaysia, Celcom became the second telco that began to sell the Blackberry Z10 device bundle plan yesterday. However, I did not see any surprise on Celcom plan, it looks very similar to others device bundle plans – Voice Plan + Data Plan + discounted device pricing. But interestingly Celcom has also introduced their Celcom First mPro Plus as device bundle plan, this plan looks quite attractive. This plan is similar to DiGi SmartPlan, which is data plan, but allow voice and sms. This entry was posted in Communication and tagged blackberry, Celcom, z10 on April 9, 2013 by RMvalues. Blackberry Z10 is the revolution smartphone of RIM. It’s a first full touchscreen and keyboardless blackberry running on Blackberry OS 10 (BB10). 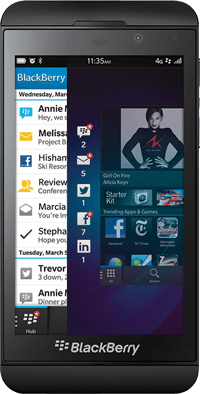 Blackberry Z10 equipped with 1.5GHz dual core CPU, 2GB RAM, 16GB storage, 8MP rear camera, 2MP front camera with LTE (long-term evolution) ready. Maxis as a first telco that brought Blackberry Z10 into Malaysia 1 month earlier than other telcos as well as local market reseller, and I’ve revealed the Maxis Blackberry Z10 postpaid contracted plans earlier. The current market price for Blackberry Z10 is RM 2,188. However, I’m here to show you another option to get your lovely Blackberry Z10 from Maxis for just RM 1,688 without any contract. Yes, it’s true, only RM 1,688. However, there is some criteria you must fulfil. This entry was posted in Communication and tagged blackberry, Hotlink, rebate, smartphone, z10 on March 18, 2013 by RMvalues. Recommended Retail Price for z10 in Malaysia is RM 2,188. This entry was posted in Communication and tagged blackberry, Maxis, z10 on March 6, 2013 by RMvalues.